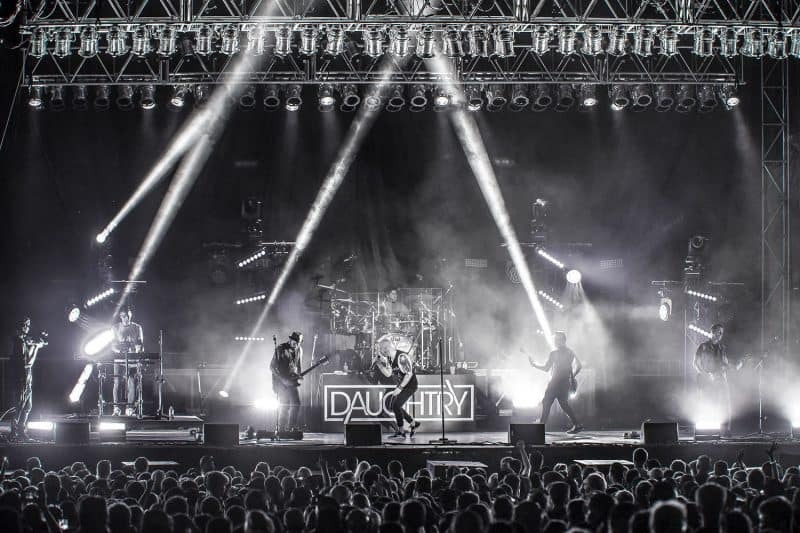 ARCADIA, Wis. – Ashley for the Arts, one of Wisconsin’s largest charity events, hosted more than 70,000 guests at the three-day music and art festival in Arcadia’s Memorial Park this past weekend. The event, celebrating its 10th anniversary, saw an increase of 20,000 visitors in attendance over last year. With a vision of showcasing the arts and supporting humanity, Ashley for the Arts raised $535,500 for 51 participating school districts and non-profit organizations over the weekend. Thursday, August 9, commenced the event with the annual Pursuit of a Cure 5K (and Miracle Mile) Run-Walk. Pursuit of a Cure is a fundraiser to advance medical research and help offset the medical-related costs that patients incur. Each of the 165+ participants selected the charitable organization that 100% of their registration funds went towards. More than $18,000 was raised throughout the weekend benefitting the American Cancer Society, Rita Tranberg Memorial and the Arcadia Ambulance Service. On Friday, over 100 art and craft vendors lined the north side of Memorial Park Drive and the baseball field, displaying their unique artwork and products. Coupled with the tropical sound of the Panhandlers steel drum band, guests participated in interactive art classes such as needle felting, acrylic painting and more. The aroma of numerous food vendors filled the air while stilt walkers, an interactive drum circle, two air parks, circus acts and more captured the crowd’s attention. 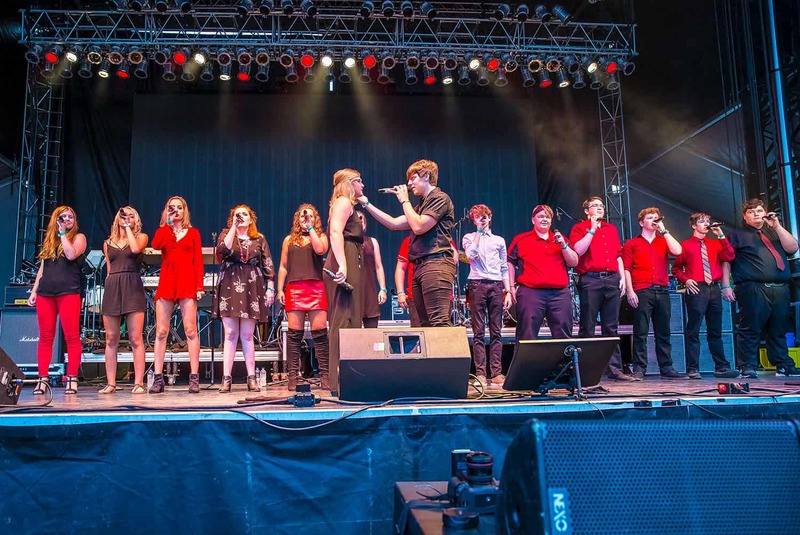 Two of the 23 supported school districts, Aquinas and Hope Lutheran, performed on the iconic Amphitheater Stage to kick off the night’s musical entertainment. On the Main Stage, headlining entertainers ZZ Ward, Rick Springfield, Daughtry and Chris Janson delivered incredible performances to over 22,000 people followed by the Tim Sigler Band debuting the venue’s new Soldier’s Walk side stage to end the night’s festivities. The third and final day of Ashley for the Arts opened with the Cruisin’ for the Arts car show. Nine additional supported school districts lead the music entertainment on the Amphitheater stage. Arcadia (the Accidentals and Jazz Ensemble), Blair-Taylor Band, Cotter Marching Band, Lincoln High School, Independence Music Department, Galesville-Ettrick-Trempealeau Jazz Band, Eleva-Strum and Whitehall’s Music Departments. 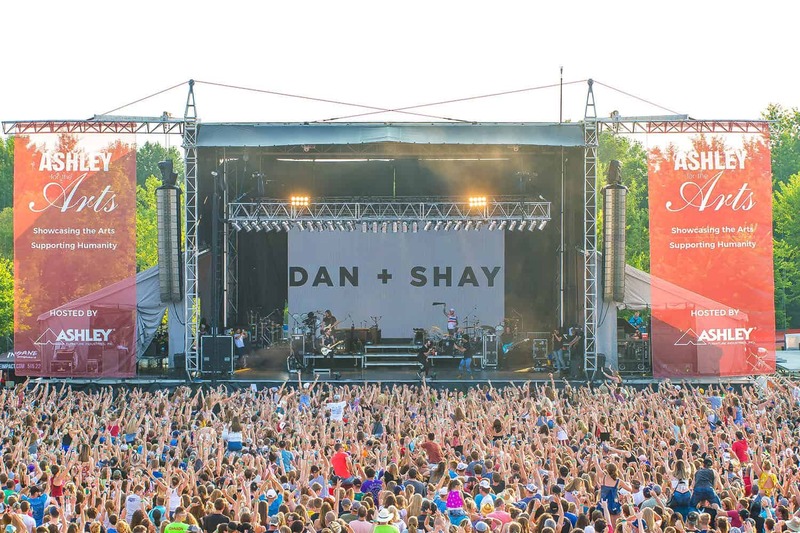 As Saturday progressed, more than 50,000 people filled into Memorial Park to see headlining performances which kicked off with LYGA followed by Carly Pearce and Dan + Shay, who had the crowd screaming loud while hot air balloons sailed over the stage. In between the Main Stage acts, Galesville-Ettrick-Trempealeau’s Vocal Point showcased area school talent by performing three A Cappella songs. 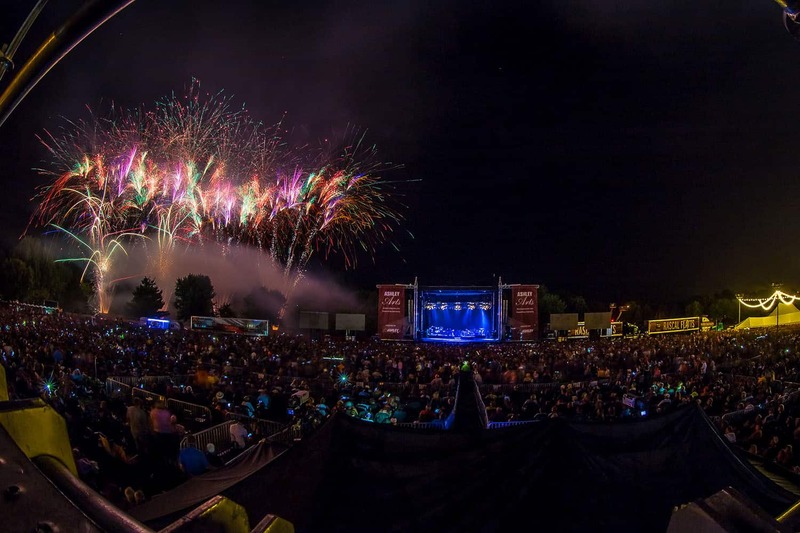 Andy Grammer played a memorable set that was followed up with a grand fireworks display, put on by Maximum Load Fireworks, that lit up the night sky and set the tone for the final, largest act Ashley for the Arts has ever hosted, Rascal Flatts. A few main factors led to the success of this record-breaking year. Through host sponsor Ashley Furniture Industries, and numerous community and corporate sponsorships, Ashley for the Arts remained able to provide affordable access to the arts with the low admission cost of $10 for the entire weekend. In addition, it took over 3,400 volunteer shifts to put on this one-of-a-kind non-profit event. The event staff also commends local emergency service personnel and security personnel for their assistance. 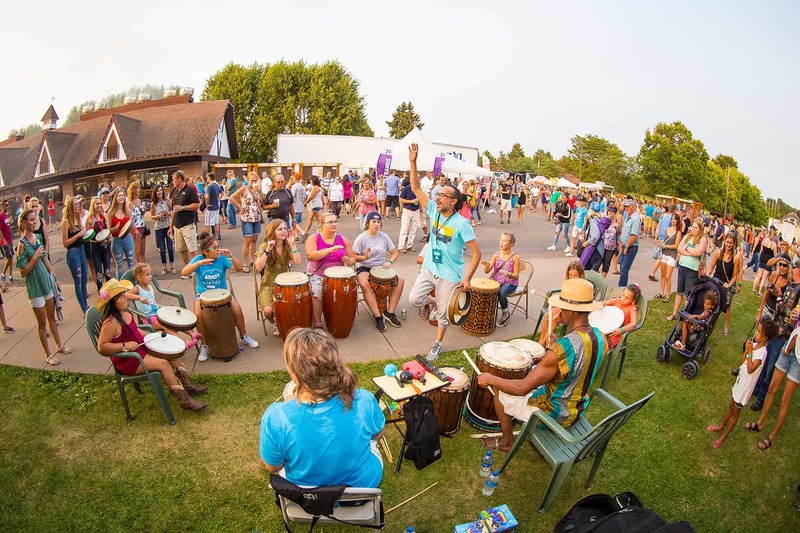 Ashley for the Arts looks forward to maintaining its popularity as one of Wisconsin’s largest charity events and a world-class music and art fest destination. Save the date for 2019, August 8, 9 and 10 in Arcadia, Wisconsin.